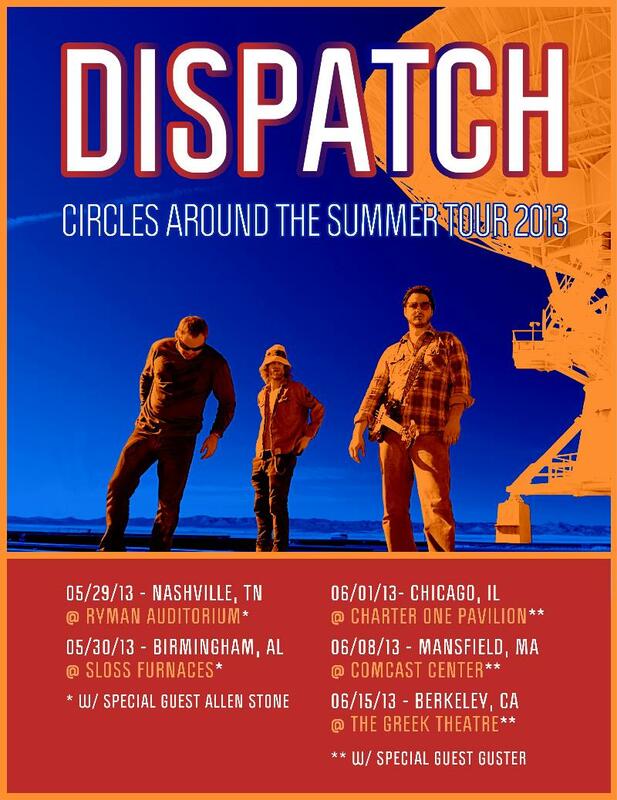 Dispatch today announced the dates for their forthcoming Circles Around The Summer Tour 2013. The run of dates will kick off on May 29th in Nashville, TN at the Ryman Auditorium and wrap up on June 15th in Berkeley, CA at the Greek Theatre. Guster will join the band for the outdoor shows in Boston, Chicago, and Berkley and Allen Stone will support the Nashville and Birmingham dates. The band will also perform at the Wakarusa Festival in Ozark, AR and Mountain Jam in Hunter Mountain, NY. See below for a complete list of dates, and stay tuned for more festival announcements. Tickets for these 5 shows will go on sale on Friday, February 1st at 12:00 PM local time (10:00am local time for the Berkeley show). A special fan presale will kick off on Monday, January 28th at 12:00 PM venue local time HERE. For more information on all upcoming dates, click here. Dispatch is currently touring in Europe in support of their latest album Circles Around The Sun, which was released last August via their own Bomber Records and debuted at Number 24 on the Billboard 200 Albums Chart, marking the band's highest chart entry in their 16-year history. Produced by Peter Katis (Interpol, Jonsi, The National), Circles Around The Sun is an eclectic rock and roll rock that delivers on the gutsy storytelling, compelling songwriting, and radiant harmonies that earned the band its diehard fanbase. Relix Magazine said, "Dispatch fans old and new will embrace Circles Around The Sun." Since the very beginning, Dispatch has been a band that has stood up and rallied its fans behind causes that challenge the status quo. In continuing the tradition of integrating a message with their music, the band have been participating in a variety of activities through out their tour to support their Amplifying Education campaign, which mobilizes the Dispatch community to take small actions to address America's education crisis and make a difference in the lives of children across the country. Eight lucky Dispatch fans had the opportunity to spend one week traveling and volunteering with Dispatch on the Fall 2012 Circles Around The Sun Tour as part of the Amplifying Education Alternative Break Tour. The filmmakers at Take Part documented their entire trip and created a web video series entitled Dispatch: Turning The Tide. To watch the webisodes, click HERE. In keeping with tradition, $1.00 from every ticket sold on the Circles Around The Summer Tour will be donated to the Amplifying Education initiative.